Home / Baby's Essentials / BabyProducts / Featured Posts / Mother Sparsh / Wipes / Are Mother Sparsh Wipes Worth Buying? When you search on Google for the name of the good wipes or “best baby wipes" in India, then turns up more than a thousand names on our laptop or mobile screen and that will make us confused. Right now there are so many brands of baby wipes, at many different price points, claiming to be made with 100% natural ingredients or for sensitive skin, even they claiming on their fabric etc. and really it can be hard to know which wipes to choose. As a mother, I am very aware of my kids. So I always try to give them the best things so whenever I purchased any products including a skin care product for them, I did research. In the last 2.5 years, I have used about 7 to 8 different types of wipes from various brands. To be honest, no one can make me fully happy with their products. Some had a very strong scent, some made with polyester etc. 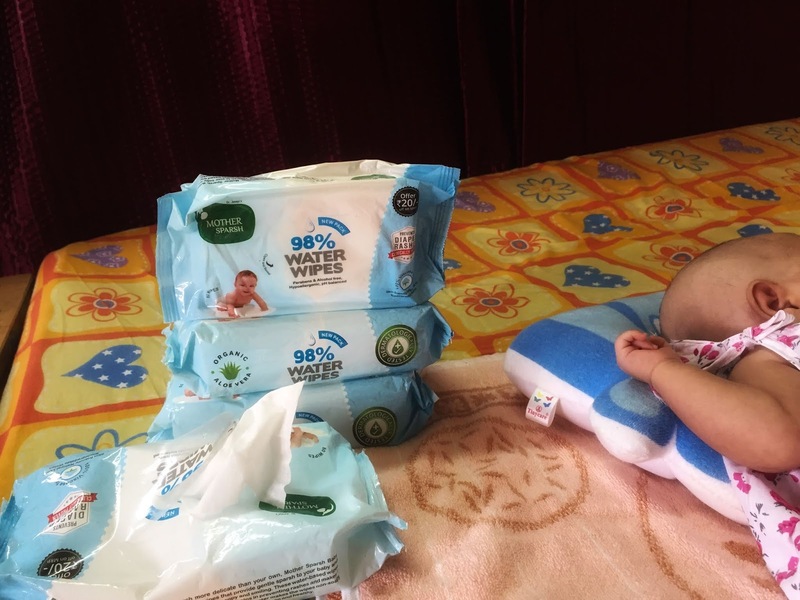 Then I thought there was a need to try something new for my newborn and I discover mother sparsh wipes. Parenting blogs, forums, magazines and product pages everywhere flooded with the positive thoughts. Honestly speaking, I just didn’t believe the hype. I heard they were perfect for newborn skin and people were saying they had nothing in them other than water, it contains 98% water. I first bought a packet to see that it suites my baby's skin or not. Moreover, these wipes are now the top most favorite wipes of parents so I also wanted to verify that it is a worthy buy or not. It’s obvious to me now how the wipes are so different. I found Mother Sparsh wipes thicker than regular wipes, much softer and really moist as good as cotton and water which makes clean-up easier to me. Earlier I have tried lotion based wipes for my son. To be honest I found them very soapy and with strong perfumed and for sure these wipes were contained chemical elements. Whereas Mother Sparsh wipes are the only Alcohol and chemical-free wipes and contain 98% purified water these wipes are totally nonsticky and nonsoapy. This is the best features of this Mother Sparsh wipes. Another best features of this wipes are their texture. The wipes are made with skin-friendly natural fabric which is super soft, so I use them on my son's face when he gets messy on mealtime and they provide very safe and effective cleansing. The texture of the wipe is soft and flexible. So they don't tear very easily. That unique texture makes the best. Regular wipes are made with polyester that might be causes rashes and redness on the sensitive skin of our kids. Where Mother Sparsh Wipes are made up of plant-based fabric which makes them skin friendly as well as eco-friendly. The most interesting thing that you can squeeze a water wipe and actually squeeze the water out. If you did that with other brands, nothing happens. Even what I saw in the last wipe has contained enough water but other baby wipes dry very quickly inside the packet. This just shows that they really are different. Yes, Mother Sparsh Wipes are totally worth the buy and I won’t be using any others on her bum going forward. Yes, I stock some more in my collection.